Mix warm lard, salt, vinegar, and 2 cups lukewarm water in a large bowl to combine. Gradually add 6 cups flour, mixing with a sturdy wooden spoon or your hands until a shaggy dough forms. Transfer dough to a lightly floured surface and knead until mostly smooth and no dry spots remain, about 2 minutes. Wrap in plastic and chill at least 2 hours. Cut shrimp in half lengthwise, then finely chop and set aside. Heat 2 Tbsp. olive oil in a large saucepan over medium-high. Add wine and cook until reduced by half, about 2 minutes. Add 2/3 cup water; bring to a boil. Reduce heat to low and simmer until reduced by one-third, 6–8 minutes. Strain stock through a fine-mesh sieve into a heatproof measuring glass, pressing on solids; discard solids. Wipe out pan, add remaining 2 Tbsp. olive oil, and set over medium heat. Cook onion, stirring often, until softened but without taking on any color, about 5 minutes. Add garlic and cook, stirring, until softened, about 3 minutes. Add shrimp stock and reserved shrimp and cook, stirring occasionally, until most of the shrimp have turned pink, about 2 minutes. Mix in butter, cilantro, lemon zest, and red pepper flakes; season with salt. Let cool 20 minutes, then transfer to a medium bowl. Cover all but 1 piece with plastic wrap and chill. Roll out remaining piece of dough to a 14" round about 1/16" thick. Using cutter, punch out 6 rounds from dough. Place 1 Tbsp. filling in the center of each and brush water halfway around edge of each round. Fold dry side of dough up and over filling to create a semicircle. Pinch edges to seal; crimp. Transfer to a parchment-lined rimmed baking sheet. Meanwhile, pour vegetable oil into a large heavy pot fitted with thermometer to come halfway up sides. Heat over medium-high until thermometer registers 350°F. 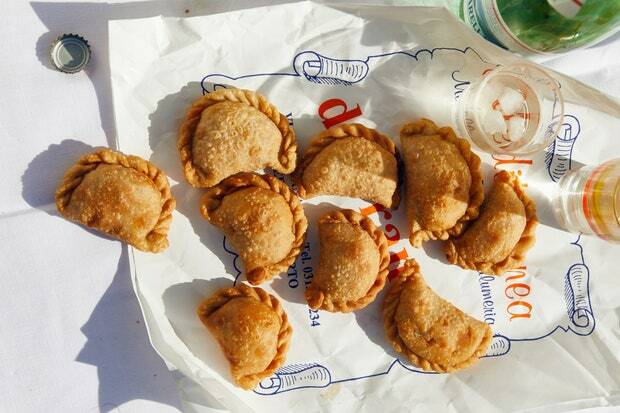 Working in batches and adjusting heat to maintain temperature, fry empanadas, turning often, until deep golden brown, 5–7 minutes per batch. Transfer to a wire rack set over paper towels; let cool 2 minutes before serving.